Why would Google replace its logo with a barcode? Probably because barcodes were invented 60 years ago. "This invention relates to the art of article classification and has particular relation to classification through the medium of identifying patterns. It is an object of the invention to provide automatic apparatus for classifying things according to photo-response to lines and/or colors which constitute classification instructions and which have been attached to, imprinted upon or caused to represent the things being classified," explains the patent. 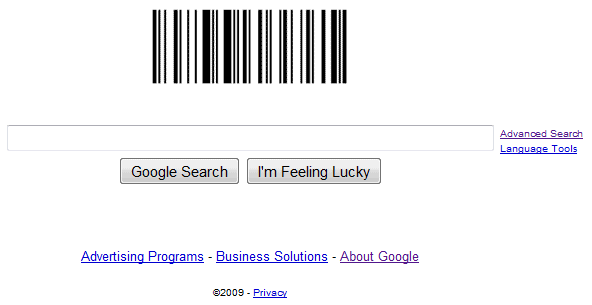 To decode the doodle, upload the image to onlinebarcodereader.com and you'll notice that it uses Code 128 to encode "Google". There's also an online barcode generator. It's not the first time when a doodle encrypted Google's name: Samuel Morse's birthday and Louis Braille's birthday were other opportunities for cleverly hiding Google's logo. @son_of_malcom: The other two encoded logos were representations of the name Google. Morse code is an audible code and Braille is a series of raised dots pressed or molded onto a surface. The dash-dot code is not affected in any way by the color, and of course the color is insignificant to a Braille reader. I never understand the confusion concerning these logos. The first line reads "Why would Google replace its logo with a barcode? ", then continues on speculatively with "Probably because...". The ALT tag specifies the intent. Just hover over the logo. This one reads "Invention of the Bar Code". Not too mysterious. The online barcode reader doesn't tell you there's a "ding!" at the end of the code. The Google doodle actually has a BEL character just before the stop code. And it's not 60 years ago, it's 57. I used Barcode Scanner on HTC hero. Much easier than uploading files. Alex you dont have an Android ? I love google for this. Because google teach to people a lot of science information. 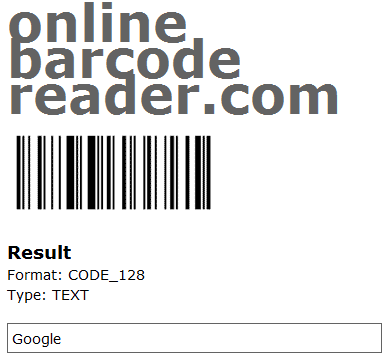 Thanks for mention my onlinebarcodereader.com. @Sam: thats strange because this library is used by onlinebarcodereader.com. Also my system makes some image preprocessing. Google is part of NWO. They're celebrating the creation of the mark of the beast. How convinient that IBM announced `Bar Code Reader’ for DNA same day. F**k you Google. @Xammer: It's 60 years ago, not 57. 57 years ago was when the patent was issued, but if you look closely, the request for patent was filed Oct 20 1949. So Google took the day from the patent issue with the year of the filing. They should have done their barcode logo celebration on the 20th of October. I'm glad that the barcodes spreaded everywhere, i am developing 2d barcode scanners modifying OEM barcode scanners from Motorola and i hope that the 2d barcodes will be adopted soon enough in supermarkets and shops.